January is National Radon Action month and the Environmental Protection Agency is asking homeowners to “save a life” by testing for radon and fixing any problems they find. Radon is a radioactive gas and exposure to it causes 21,000 lung cancer deaths per year—only smoking causes more. Because you can’t see, smell or taste radon, it’s important to periodically test the air in your home. Believing you live in a region not affected by radon is just one of the myths about this deadly gas. Here are the EPA’s top 10. Myth 3: Homes with radon problems can’t be fixed. Myth 6: A neighbor’s test result is a good indication of whether you have a problem. Myth 8: It’s difficult to sell homes where radon problems have been discovered. Myth 9: I’ve lived in my home for so long, it doesn’t make sense to take action now. Fact: You will reduce your risk of lung cancer when you reduce radon levels, even if you’ve lived with an elevated radon level for a long time. Myth 10: Short-term tests can’t be used for making a decision about whether to fix your home. 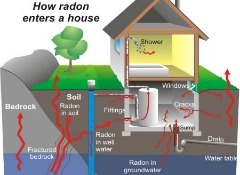 Fact: Short-term tests can be used to decide whether to reduce a home’s high radon levels. However, the closer the short-term testing result is to 4 pCi/L (pico Curies per Liter), the less certainty there is about whether the home’s year-round average is above or below that level. Keep in mind that radon levels below 4 pCi/L still pose some risk and that radon levels can be reduced to 2 pCi/L or below in most homes.